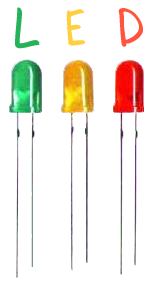 The LED or “Light Emitting Diode” is a diode that emits light when electricity flows through it. You can find LEDs in many different colours, shapes and sizes, everything from superbright “star” leds and infrared LEDs (invisible to the naked eye) to RGB LEDs (that can display any colour in the rainbow) and blinking or pulsating LEDs. Just Like an ordinary diode only allows electricity to flow through it in one direction, so does the LED. the electricity can only flow from + to -. To tell + and – apart the diodes have one long and on short leg. The long leg is the positive leg (the anode), and the short leg is negative (cathode). If you connect it the wrong way, no electricity will flow and the diode will not light up. You wont bread the diode though. One thing to be careful about when using LEDs though, is to always use a “current limiting resistor. If we just connect the LED directly to the + and – pf a 9V battery it will burn out and die almost instantly (some times even explode). To avoid this we need a little resistor in series (before or after the LED), to limit the amount of current that will pass through the LED. Usually a 220ohm resistor (red red brown) will do the trick just fine. But to find exactly what one you need for your LED you can use an online calculatoir like this one or this one. If we want to hold on to the pipes and water analogy here then the LED is a kind of valve that will only allow the water to go through in one direction, from + to -. One thing we have to be careful of when playing with leds is to always use a current limiting resistor. This is a resistor in series (either before or after the LED) that limits the current going through the LED so it doesn’t burn out. If you just connect the LED to the + and – of a 9V battery, it will burn out and die allmost instantly. Here and here are some calculators to help find what resistor to use.